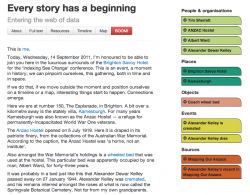 At the start of 2012 QueryPic was a fairly messy Python script that scraped data from the Trove newspaper database and generated a local html file. It worked well enough and was generously reviewed in the Journal of Digital Humanities. But QueryPic’s ability to generate a quick visualisation of a newspaper search was undermined by the work necessary to get the script running in the first place. I wanted it to be easy and accessible for everyone. In the meantime, I headed over the New Zealand for a digital history workshop and began to wonder about building a NZ version of QueryPic based on the content of Papers Past, available through the DigitialNZ API. The work I’d already done with the Trove API made this remarkable easy and QueryPic NZ was born. Once the Trove API was publicly released I finished off the new version of QueryPic. Instead of a Python script that had to be downloaded and run from the command line, QueryPic was now a simple web form that generated visualisations on demand. The new version also included a ‘shareable’ link, but all this really did was regenerate the query. There was no way of citing a visualisation as it existed at a certain point in time. If QueryPic was going to be of scholarly use, it needed to be properly citable. I also wanted to make it possible to visualise more complex queries. And so the next step in QueryPic’s evolution was to hook the web form to a backend database that would store queries and make them available through persistent urls. With the addition of various other bells and whistles, QueryPic became a fully-fledged web application — a place for people to play, to share and to explore. The Front Page was also the first resource published on my new dhistory site (since joined by the Archives Viewer and QueryPic). dhistory — ‘your digital history workbench’ — is where I hope to collect tools and resources that have graduated from WraggeLabs. In 2012 I also revisited some older projects. After much hair-pulling and head-scratching, I finally managed to get the Zotero translator for the National Archives of Australia’s RecordSearch database working nicely again. I also updated it to work with the latest versions of Zotero, including the new bookmarklet. My various userscripts for RecordSearch also needed some maintenance. This prompted me to reconsider my hacked together alternative interface for viewing digitised files in RecordSearch. While the userscript worked pretty well, there were limits to what I could do. The alternative was to build a separate web interface… and so the Archives Viewer was born. Two things I made in 2012 are rather special (to me at least). Instead of responding to particular needs or frustrations, these projects emerged from late night flashes of inspiration — ‘what if…?’ moments. They’re not particularly useful, but both have encouraged me to think about what I do in different ways. 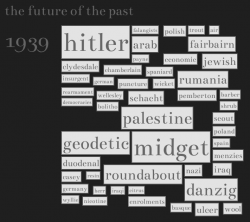 The Future of the Past is a way of exploring a set of newspaper articles from Trove. I’ve told the story of its creation elsewhere — I simply fell in love with the evocative combinations of words that were being generated by text analysis and wanted to share them. It’s playful, surprising and frustrating. And you can make your own tweetable fridge poetry! 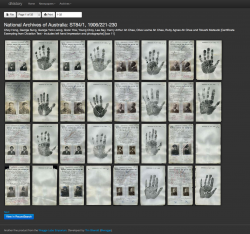 One night I was thinking about The Real Face of White Australia and the work I’d done extracting photos of people from the records of the National Archives of Australia’s database. I wondered what would happen if we went the other way — if we put the people back into RecordSearch. The result was The People Inside — an experiment in rethinking archival interfaces.